Why look any further? This fabulous beachfront estate has it all—and all that it has is wrapped in total deluxe luxury. Time after time, guests remember this estate as the best villa in the Lagos del Mar refuge, which is a gated enclave within the Punta Mita resort peninsula. Time after time, they call it, simply: the best. Boasting the most unobstructed and expansive views of the ocean and the Bay of Banderas, this grand estate—which is but a short 70 yard walk from the beach—is one of the largest within the gates of Lagos del Mar, offering the ultimate in tranquil open air living, inside and out. With a poolside space that is four times that of most of the houses in Lagos Del Mar, the villa’s serene outdoor setting features lush landscapes, expansive lawn and tropical gardens weaving throughout the property. And because one of the area surf breaks lies just beyond the villa, you can easily assess if the surf’s up from the garden. Offering full access to four private Resident’s Beach Clubs, two golf courses, a ten-court tennis center and a full fitness center—all within walking distance—this beautiful villa, which is located near the town of Punta Mita, provides as much activity as it does relaxation. Whether you’re looking to wind up or down, you’ll find the perfect solution here. Each of the villa’s five spacious and sophisticated suites features its own open view of the ocean, private lanais, king or dual queen beds, an outdoor and indoor shower, luxurious Egyptian cotton sheets, air-conditioning, daily turn down service and much more. Impeccably decorated by Four Seasons designers, each suite is marvelously outfitted with wood, marble and onyx throughout. Wireless is also available throughout. With multiple housekeepers, a cook, gardener, concierge, and houseman, rest assure that all of your needs will be met with warmth and care. The house services include grocery shopping and the preparation of breakfast, lunch and snacks. Go ahead, make yourself comfortable in the hammock, grab a pair of binoculars, peer out at the endless succession of turquoise waves, the bobbing sailboats and the magnificent Sierra Madre mountains across the bay—you might even spot a whale or dolphins enjoying the ocean waters. And you’ll likely think to yourself: This place is, simply, the best. We absolutely love Mexico and particularly Punta Mita. We enjoy working on our Spanish and experiencing the culture of Mexico. While inside the gates of Punta Mita, we are absolutely at ease, it is sublimely pristine, the beaches are covered with white sand, they are quiet, the beach clubs are beautiful and well attended, and there are several spots that are some of the most beautiful that I have ever seen. We also chose Punta Mita versus one of the other resort areas because it has more to offer - 2 private golf courses (my husband is a 0 handicap, loves to golf), tennis, multiple beach clubs, The Four Seasons Resort and The St. Regis, and much more. The villa is set on a hill above the 8th Hole of the Jack Nicolas golf course. The view is of the ocean and the beach and as well as the yachts and sailboats that are often moored there. The golf course can be viewed from the second floor as well as the edge of the property. The house is on the 8th fairway, but is situated slightly above it, which allows for many perfect views of the ocean and some of the fairway as well. The view is often cited as 'the best' in Lagos. Due to the lay of the land, all of the bedrooms have ocean views and the views are extensive from the other parts of the villa. Guests can access the ocean by walking over the 8th fairway and onto the beach. There are telephones in each bedroom suite. Available in all of the bedroom suites. The media room, kitchen and dining rooms are also air conditioned. The ultimate in luxury. Woven from 100% Egyptian cotton, indulgently soft, 800-thread count sheets which are exquisitely designed and expertly tailored to provide a wonderful night’s sleep. (2) The villa has 2 washers and 2 driers. If you would like, our on site staff will assist you with your washing and drying needs. Wireless access is available throughout the villa including next to the pool, on the balconies, in the garden and overlooking the ocean. (2) The kitchen contains two dishwashers to accommodate large groups or parties. (2) This top of the line kitchen is attended by Luisa, the villa's accommodating cook and able assistant if the guest wishes to cook. The house has a comfortable media room with a large screen TV. There are 4 televisions in the house with canadian cable which provides access to a large number of channels. Large music library which is pre-loaded and can be accessed and played from various wall touch screens throughout the house. Large video library which is preloaded and available from an on-screen menu in the media room. The three second floor suites have balconies with outstanding ocean views. Extensive smooth slab stone patios throughout the villa overlooking the pool, garden, fountain and ocean. Guests have access to tennis facilities, offering grass and hard courts along with lessons, clinics, and reserved court times. Guests have membership privileges to two world-class Jack Nicklaus golf courses, Bahia and Pacifico. Warm tub attached to the pool. We stayed at this beautiful home with another family. There were 11 of us, including 7 kids. Upon our arrival, we were greeted with cold towels, delicious margaritas, fruit smoothies, for our kids, and welcoming smiles from Arnaldo, Luisa and Caesar. The view of the ocean as you walk in the entryway is breathtaking. All of the bedrooms were lovely, clean, well appointed with ocean views and balconies or patios from all of them. The house cleaning staff kept the house impeccable with fresh linens and towels daily. The pool and patio area were meticulously maintained. It truly is like staying at a five star hotel. ..but better. The breakfasts, margaritas and lunches were delicious. Luisa and Arnaldo happily made our kids their favorite foods as well as fabulous, authentic Mexican favorites for the adults. The service we received was also excellent. We actually thought the food at the house was better than our meals out. The two golf carts were ideal for transporting all of us to the various beach clubs and Punta Mita restaurants for dinner. On our last day, we lounged by the pool, viewing the gorgeous ocean, drinking our margaritas and discussing the next time we would return to beautiful Ciada de Agua. I would highly recommend this property. We had a great time! Amazing house with every amenity and perfect views from the very private rooms. The numerous staff pampered us throughout our stay. The breakfast and lunch every day was creative and very fresh. Arnoldo and Louisa work great together and knew what we needed before we did. Cesar never let us get to the end of a beverage before he offered another. Perfectly laid out for multiple couples. We loved our family stay at Casa de Agua! We traveled with another family, 11 of us in all, kids ages 5-21. Everyone had the best time! The villa was perfect, very clean, comfortable and exceeded our expectations! From booking with Libby to the friendly & helpful villa staff it was great! Louisa and Arnoldo prepared delicious meals each day that we all will miss! Thank you for our wonderful time! When we arrived and saw the staff waiting with warm, moist towels and margaritas, and viewed the gorgeous water feature sweeping toward the Bay of Banderas, we knew we were in for a royal treat. My older Grandchildren, at that point, hugged me and thanked me profusely. They knew they were in heaven, too. We were toured through the beautiful, well appointed, suites and settled in our heavenly environment. food is the best that exists in Punta Mita. We ate out a couple of times, but always wanted to return to the Villa for comfort and good food. For my family, it will be a memorable experience. We ranged from 2 1/2 to 82, but all were very content. Libby does a superb job of planning. All the plans we made together were well accomplished. I am a owner of a HomeAway rental in the Napa Valley, so I look for specific things that make for comfort. It had it alL and more. What an amazing experience-Caida de Agua and it’s staff is truly a remarkable and lovely place. 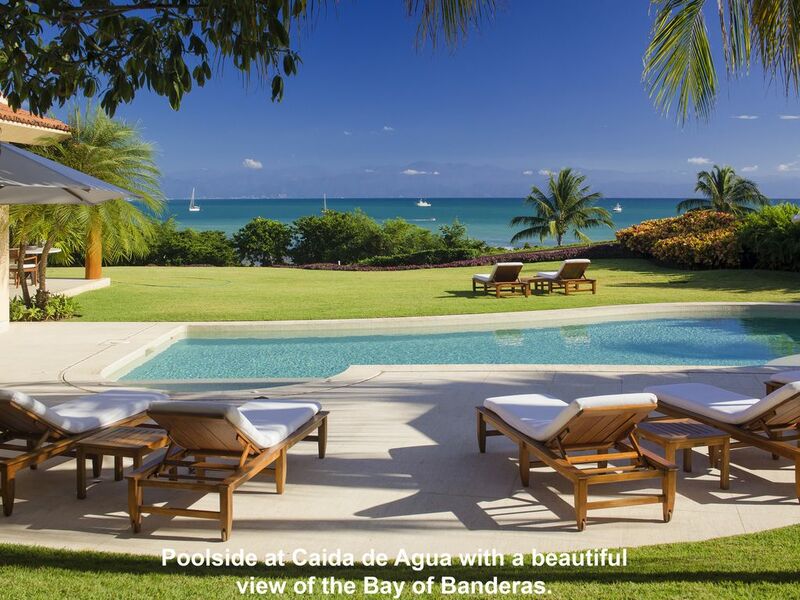 Caida de Agua has membership to both private golf courses within the gates (many of the rental villas do not), which gives our guests access rights to the golf courses. Surfing available by foot 5 minutes down the beach, whale watching and private panga rides to the Marietta Islands, snorkeling, and adventures - such as zip line excursions and back road trips. The house will be stocked with food and drinks upon your arrival and Luisa will have snacks ready for you. She will also be preparing your first meal as you arrive and prepping for your upcoming meals. The food deposit covers your direct cost of food plus a 10% fee which covers gas and outside shopping services. Receipts and an itemized report will be provided at the end of your stay.